Possibly Edwin D. Morgan, [1811-1883], New York; possibly (his estate sale, Chickering Hall, New York, January 1886, no. 8). William H. Gerdts, New York, by at least 1965; gift 2018 to NGA. Per documention from Abigail Booth Gerdts provided with gift, in NGA curatorial files. [Still lifes of edible subjects from the collection of William H. Gerdts, on occasion of publication of cookbook by William and Lois Katzenbach], Board Room, American Federation of the Arts, New York, c. 1965, no catalogue, label no. 13. Mid-Nineteenth Century American Painting from the Collections of Henry M. Fuller and William H. Gerdts, Cummer Gallery of Art, Jacksonville, 1966, no. 37, repro. American Cornucopia: 19th Century Still Lifes and Studies, The Hunt Institute for Botanical Documentation, Carnegie-Mellon University, Pittsburgh, 1976, no. 31, repro. 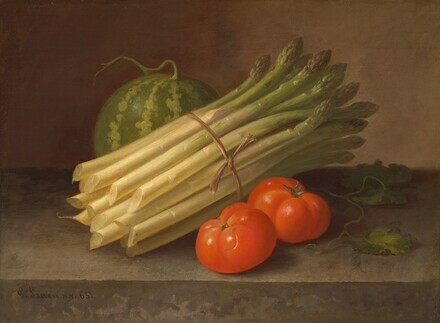 Painters of the Humble Truth: Masterpieces of American Still Life, 1801 – 1939, Philbrook Art Center, Tulsa; Oakland Art Museum; Baltimore Museum of Art; National Academy of Design, New York, 1981-1982, no. 5.15. For Beauty and For Truth: The William and Abigail Gerdts Collection of American Still Life, Mead Art Museum, Amherst; Berry-Hill Galleries, New York, 1998, plate 13. Gerdts, William H., and Russell Burke. American Still-Life Painting. New York, 1971: 60, 67, pl. VIII. Smith, Andrew F. The Tomato is America: Early History, Culture, and Cookery. Columbia, SC, 1994: 195.